My M44/getrag didn't have a CDV so you may not need the delete. I did all that stuff except for the lower temp tstat and coolant sensor, what's the benefit of those? I didn't know they made a lower temp sensor. I had to have a friend machine the tstat housing flat so that it would seal correctly. The cheap housings all come from china and are cast aluminum. It's good to clean up the casting flash inside too. I used stock exhaust manifolds to the OBD2 midpipe and then a Z3 3.0i catback, had to cut it down slightly but the exhaust hangers all lined up. Awesome! That's good to know! As far as clutch is concerned. Do you guys have any opinions on a decent cheap option? Is the valeo kit a decent kit? I should be commencing my swap next week. I got all the parts I needed ordered. I have my swap car lined up and the 318ti waiting a new transplant. Is there anything I’m forgetting that you guys can think of? Thanks again for all the help and support! I had to read the wire diagrams, wiring is not my strong point either, lol. No pictures unfortunately, I had to get it done quickly so my car would pass inspection. When I finally have a need to pull the engine apart I'm probably going to install a manual M52 wiring harness, it bothers me to have the auto trans stuff just hanging around in there. In the wiring harness X20 connector, I had to add pin 10, that is the signal to the reverse light plug. And then in the plastic box of wires that sits over the engine, there is a junction in there that I spliced the power wire for the reverse light switch into. If you trace pin 22 from the X20 to the plastic box, that is what I spliced into. No you don't need the TCU, that and the associated wiring just gets ignored. So I am balls deep in the swap right now and I am a little confused on what to do with the reverse light. from what I understand this is what I need to do. Sounds like what I did, it was a while ago but yeah. Did you get it to work? EDIT - My car does not have the x69. My car had the x69 so I can't help there, did you find any threads talking about it here or on bf.c? I haven’t gotten that far. I have posted on bummer forums and here looking for an answer by haven’t found anything. I’m also waiting on a clutch to come in. Was your ti originally a auto or manual? 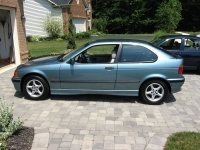 Mine is a '98 manual ti with engine from a '97 auto 328i. I am figuring out how to wire my light up too. S52 from 97 auto, into 99Ti manual. I just solved the low speed fan riddle. Did anyone else notice terminal 86 in low speed relay is missing in bottom of socket? Same for AC relay next door. The diagrams do not address this, but do not tear into the fuse box. These signals don't use 86 even though the ETM displays that it does. My 99 Ti doesn't have it either. I believe it is because that connector is for auto Trans. Mine was/is also a manual car. My bad, I just looked back at the pictures in my build thread and saw that my '98 manual ti does not have the x69 connector. I forgot that I just set the auto harness connector where the x69 would be. It's been a couple years, lol. I found that out after a while of being worried. That being said my swap started right up and runs like a champ. I have one check engine light for an 02 sensor that isn’t even attached to the car. I am using a dme from a 328 that has the ews system deleted. The motor is out of a 98 323 which only had one pre cat and one post cat o2 sensor. I have the original dme but I didn’t want to have to deal with the ews system.